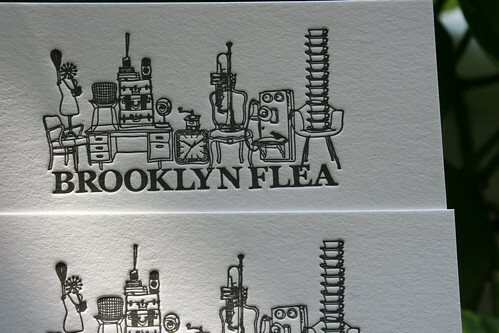 I printed these business cards for the Brooklyn Flea last week. 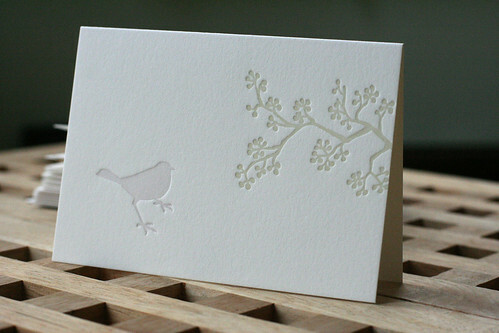 I love this graphic, perfect for letterpress. The Flea is in full swing Saturdays in Fort Greene and Sundays here in Dumbo – and I can’t wait for this year’s Holiday Market which should be even better than last year. “Going out” now means being outside. C’mon back next Monday for a new contest with an *awesome* prize. And seriously if you have any ideas for new word games let me know. Thanks again! Its Monday again…already! We’re continuing with the six-word story contest today (maybe something different next week). This week’s theme is ‘The Economy’. I know the recession is a droopy subject, but you can be as funny as you like – and the best entry wins these somewhat more cheerful letterpress cards (pack of six). We’ve been averaging about 30 entries since we started, spread the word and let’s see if we can push it to 40!! PS: Contest ends tomorrow at 10am (ET)! I love this invitation from last week. 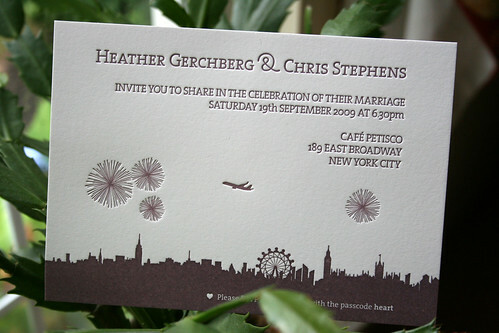 The bride and groom are from New York and London, so the groom designed their invitation to include both skylines bleeding into one. Getting good coverage on this dark plum ink color was a bit of a challenge. I ended up breaking the plate up so I could double-ink the skyline and print the rest with a single inking. This was necessary to get a solid ink coverage for the graphic without overinking the text. I printed a cool business card job late last week. 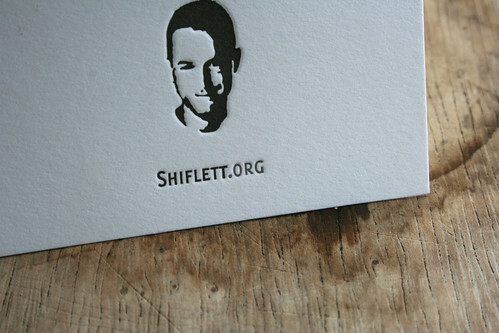 Typeface enthusiast Jon Tan designed this series for his friends and colleagues, this one for Chris Shiflett. I wonder if I can get him to do one for Gayle? “Picnic lunch turns into sunset snacks” submitted by thisisunclear. It’s just such a sweet image and very well composed. Thanks so much to everyone who wrote in, I hope you’ll keep reading and entering each week! What do you guys think, another six-word story next week or should I try something new? Its time again for this week’s contest! This week’s challenge is another six-word story and the theme is “Guilty Pleasures”. You have until tomorrow (tuesday) morning at 10am ET to submit your entry. 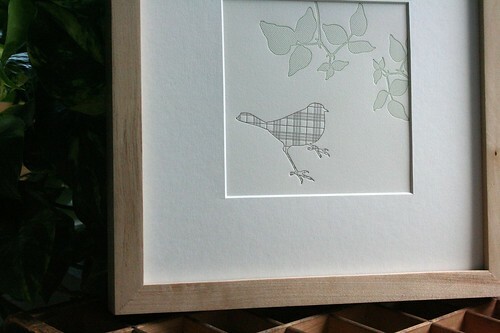 This week’s winner receives an original Moontree Letterpress framed print (pictured above). As usual I’ll start things off with my own entry below…good luck!